June 2nd, 7:30-9pm: The welcome reception will take place in the CENT I building (ground floor). June 3rd, 8 pm: Dedicated Chopin concert for participants of the workshop will be held in the Palace on the Water (also called Palace on the Isle) in Royal Łazienki Park, Warsaw’s finest and oldest park established more than 200 years ago. Concert is organised by the Fryderyk Chopin Society. To reach the Palace on the Water, you should take bus number 182, 187 or 523 at the stop WAWELSKA, and go to the stop PLAC NA ROZDROZU. There you need to find AGRYKOLA street and walk down along it. Just after you pass the bridge, from which the palace is visible, there is a gate to the park on the right. June 4th, 8-11pm: The conference dinner will be served in the restaurant "Pod Gigantami", address: al. Ujazdowskie 24, 00-478 Warszawa. To get to the restaurant you should take the tram number 7, 9 or 25 at the stop OCH-TEATR and go to the stop MUZEUM NARODOWE. 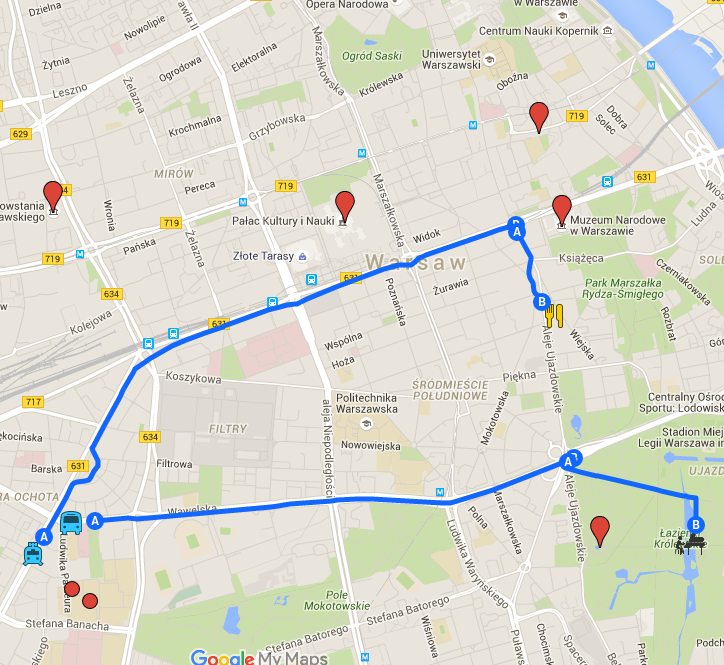 From there you have a 600 m walk to the restaurant in the direction of Plac Trzech Krzyży.